FREE BOOK PROMO start Dec. 18 to Dec. 22! Roddie is an 8 year old boy who lives with his grandmother in a small house, in a small street in a small village. Some day he finds a big old ugly box on his door step. Suddenly the lid moves. It's clear to Roddie that something inside is alive and it wants to get out. 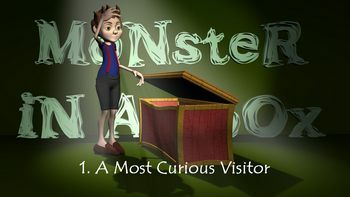 This is the first book in the 'Monster-In-A-Box'-series. It's a funny adventure. I wrote and illustrated the book myself. Each page is an illustration that supports the story. I specialize in digital 3D animation and stereoscopic graphics. I created an animated short from each book in the series, free for all readers to download as well. At present I'm working on the next parts and animations. I've been working for television in Belgium for 20 years and for the first time, I used my experience to create a story that takes the reader on an adventurous journey beyond imagination.